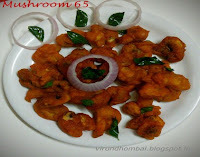 This super soft and spicy Paneer 65 are made with a few ingredients gives a tasty and healthy appetizer for your kids. My son is a great fan of different types of appetizer. He told me to prepare this Paneer 65 for evening snack. This appetizer recipe is the one of those without any additional ingredients like bread crumbs and other sauces. 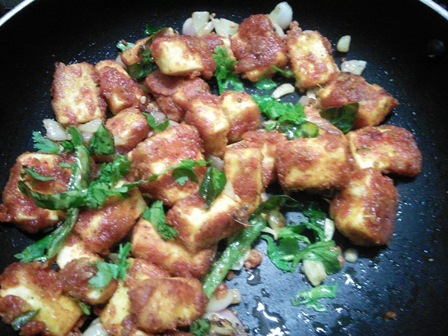 So you can easily prepare this paneer 65 within 30 minutes. 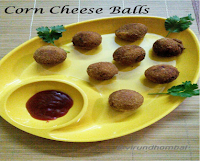 These paneer 65 have a crunchy outer layer with a soft inner layer. 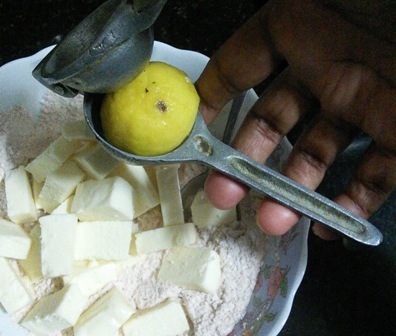 For flavours I have added ginger garlic paste, chilly powder, pepper powder, garam masala powder and finally the lemon.The best ingredient for any appetizer is the lemon juice. I always like to prepare any dishes with all the flavours in minimal level, so that it tastes the best. Now let's see how to prepare this easy snack with step by step instructions. Check out my other paneer recipes with step by step instructions Paneer Butter masala, Paneer Methi masala, Paneer Capsicum kurma. Paneer 65 - This super soft and spicy Paneer 65 are made with a few ingredients gives a tasty and healthy appetizer for your kids. Take a wide bowl and add maida, corn flour, rice flour, turmeric powder, red chilly powder, black pepper powder, garam masala powder and required salt. Mix everything together with a spoon. Add the paneer cubes and squeeze the lemon juice to it. Add water little by little and mix them gently. Do not pour more water because it absorbs more oil. Now keep it undisturbed for 20 minutes. Now heat some oil in a frying pan. 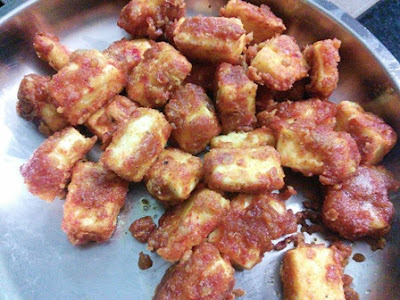 Keep on medium heat and fry the paneer cubes gently. After a few minutes flip the paneer cubes one by one. When they are fried well transfer them to a plate. 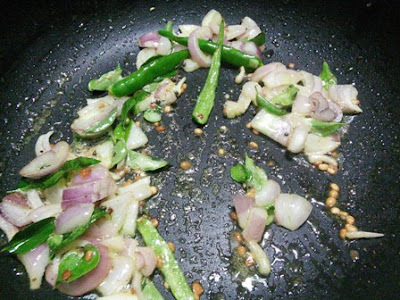 Heat oil in a pan and add the onions and green chillies. Saute them well and add the curry leaves. Add the fried paneer to this mixture and give them a quick toss. Sprinkle a pinch of salt and pepper powder over the dish and serve it hot with tomato ketchup. 1. 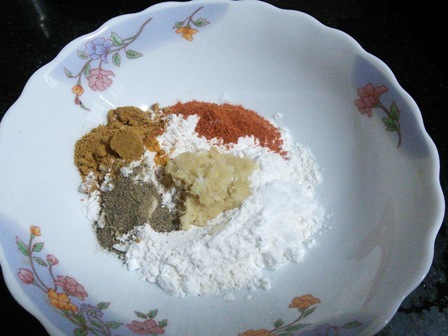 Take a wide bowl and add maida, corn flour, rice flour, turmeric powder, red chilly powder, black pepper powder, garam masala powder and required salt. 2. Mix everything together with a spoon. 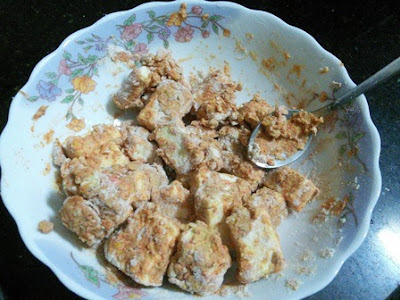 Add the paneer cubes and squeeze the lemon juice to it. 3. Add water little by little and mix them gently. Do not pour more water then it absorbs more oil. Now keep it undisturbed for 20 minutes. 4. Now heat some oil in a frying pan. Keep on medium heat and fry the paneer cubes gently. (I have used coconut oil that's why white foam layer is appearing). 5. 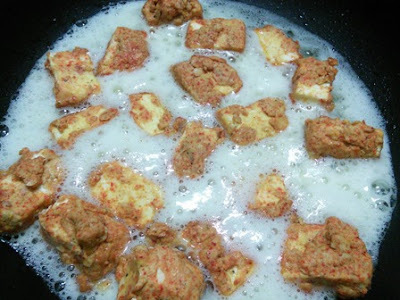 After a few minutes flip the paneer cubes one by one. When they are fried well transfer them to a plate. 6. Heat oil in a pan and add the onions and green chillies. 7. Saute them well and add the curry leaves. 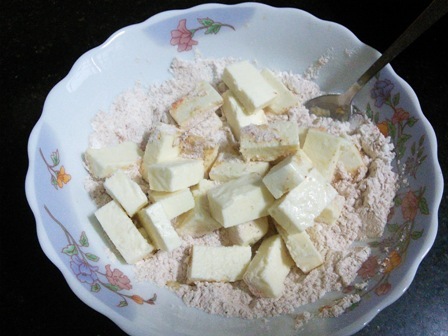 Add the fried paneer to this mixture and give them a quick toss. Sprinkle a pinch of salt and pepper powder over the dish and serve it hot with tomato ketchup. 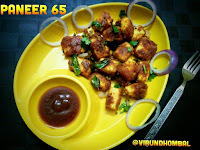 If you try this recipe for Paneer 65 send us your comments and share the recipe for your friends and family.